Good Practice Recommendations on Public Participation in Strategic Environmental Assessment available in English, French and Russian. 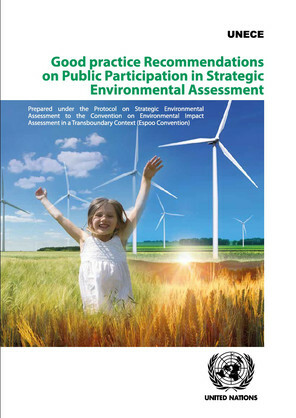 The good practice recommendations aim to improve public participation in strategic environmental assessment (SEA) as provided for by the United Nations Economic Commission for Europe (ECE) Protocol on Strategic Environmental Assessment (Protocol on SEA) to the Convention on Environmental Impact Assessment in a Transboundary Context (Espoo Convention). Their objective is to support the application of the Protocol’s provisions by Parties and future Parties as regards public participation, as well as to illustrate good practice in this field so as to promote early, timely and effective opportunities for such participation. The recommendations were prepared by the ECE secretariat, with the support of a consultant, in consultation with the Bureau under the Espoo Convention and its Protocol, and taking into account the comments by the Working Group on Environmental Impact Assessment and Strategic Environmental Assessment. The recommendations were initially discussed at a meeting on public participation in environmental decision-making (Geneva, 29–30 October 2012), organized jointly with the Convention on Access to Information, Public Participation in Decision-making and Access to Justice in Environmental Matters (Aarhus Convention). They incorporate comments and input from national focal points and experts under the Espoo Convention, the Protocol on Strategic Environmental Assessment and the Aarhus Convention received prior to, during and after the joint meeting. In addition, efforts have been made to ensure consistency between the present draft and the more general recommendations on public participation in environmental decision-making prepared under the Aarhus Convention. The Meeting of the Parties to the Convention serving as Meeting of the Parties to the Protocol endorsed the recommendations in June 2014 through decision II/8 (see ECE/MP.EIA/20/Add.2- ECE/MP.EIA/SEA/4/Add.2).